WOUND HEALING in the ELDERLY: Is THERE a DIFFERENCE? PREOPERATIVE NUTRITIONAL ASSESSMENT IN PATIENTS UNDERGOING MAJOR ABDOMINAL SURGERY: DOES BEING OLDER LIMIT RADICAL SURGERY? 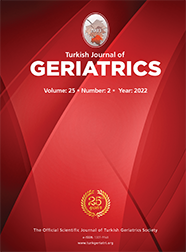 WHICH QUESTIONS ARE IMPORTANT IN THE GERIATRIC DEPRESSION SCALE IN DEPRESSION AMONG THE ELDERLY ? IS MILD COGNITIVE IMPAIRMENT AN EARLY ALZHEIMER'S DISEASE? GERIATRIC PATIENTS IN MANAGEMENT OF PIGMENTED LESIONS: SHOULD FOLLOW-UP BE RECOMMENDED? CAN POOR SLEEP QUALITY SUGGEST DEPRESSION IN ELDERLY PATIENTS UNDERGOING HEMODIALYSIS? TREATMENT OF INTERTROCHANTERIC FRACTURES IN AMBULATORY ELDERLY; BIPOLAR HEMIARTHROPLASTY OR PROXIMAL FEMORAL NAIL ? EVALUATION OF ELDERLY PATIENTS HOSPITALIZED FOR HYPONATREMIA: IS HYPONATREMIA A REAL INDEPENDENT RISK FACTOR AFFECTING MORTALITY IN THESE PATIENTS? IS THE COURSE OF PNEUMONIA THE SAME IN ELDERLY AND OLDER PATIENTS? DOES PRIMARY TUMOR RESECTION AFFECT SURVIVAL IN ELDERLY PATIENTS WITH METASTATIC GASTRIC CANCER? ARE THE BENEFITS OF PULMONARY REHABILITATION IN YOUNG AND ELDERLY PATIENTS THE SAME? A CLINICAL REVIEW OF THE CONSEQUENCES OF ANESTHESIA AND SURGERY IN THE ELDERLY BRAIN: "THE DARK SIDE OF THE MOON"
BRUCELLOSIS IN GERIATRIC PATIENTS: IS THE DISEASE COURSE MORE SERIOUS?